Many conditions can cause sharp pain in the left arm. According to MayoClinic.com, any tissue that composes the left arm--including muscles, tendons, ligaments, nerves, bones and blood vessels--can cause left-sided arm pain. 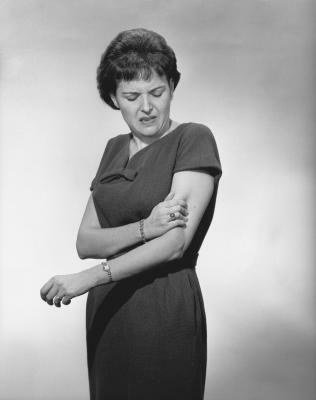 Structures outside the arm, such as tissues in the shoulder, neck and chest, can also cause arm pain. Repetitive use injuries, trauma and certain medical conditions are among the most common causes of sharp arm pain. Radial head fractures can cause sharp, left-sided arm pain. According to the American Academy of Orthopaedic Surgeons, or AAOS, radial head fractures or a fracture of the uppermost part of the radius bone--the smaller of the two long bones in the forearm--is a common injury, accounting for approximately 20 percent of all acute elbow injuries. The AAOS states that radial head fractures are more common in women than men. The majority of radial head fractures occur in people between the ages of 30 and 40. One of the most common causes of a radial head fracture is trying to break a fall with an outstretched arm and hand. Upon impact, the force of the fall travels up the wrist to the elbow, causing elbow dislocation or radial head fractures. Common signs and symptoms associated with radial head fractures include sharp pain on the outside of the elbow, swelling in the affected elbow joint, reduced elbow joint range of motion and an inability to turn the palm up or down. Postherpetic neuralgia can cause sharp pain in the left arm. It is a painful condition that affects the nerves and skin. Postherpetic neuralgia-related symptoms are often severe enough to affect a person's sleep and appetite. According to MayoClinic.com, postherpetic neuralgia occurs following a bout of shingles, a painful condition caused by the chickenpox virus. Shingles is characterized by a rash and blisters in one part of the body; postherpetic neuralgia is pain that lingers after the shingles-related rash and blisters disappear. Most people who experience postherpetic neuralgia are older than 60 years old. Common signs and symptoms associated with postherpetic neuralgia include pain in the affected area that may be sharp, burning, deep or aching, hypersensitivity to light touch, itching and numbness, muscle weakness and, in some cases, paralysis. A myocardial infarction or heart attack can cause sharp, left-sided arm pain. According to MedlinePlus, a myocardial infarction occurs when the coronary blood vessels--the vessels that carry blood to the heart--become obstructed or blocked. Inadequate blood flow and lack of oxygen to the heart can cause irreversible damage to a portion of the heart muscle along with other symptoms. Common signs and symptoms associated with a myocardial infarction include chest pain, sharp pain in the arms, shoulder, neck, jaw, abdomen or back, anxiety and feelings of impending doom, dizziness, nausea and vomiting, dyspnea or shortness of breath and excessive sweating. Possible risk factors for myocardial infarction and coronary artery disease--the leading cause of a heart attack--include smoking, elevated blood pressure, diabetes, chronic kidney disease and being a male older than the age of 65. What Causes a Sharp Pain in Left Side of the Head?